It is not the first time, and hopefully it will not be the last time. Travel puts you in unusual positions at times and you can end up with a front row seat to world events. This happened to us recently as we drove through the vast, unpopulated desert of Eastern Nevada on our way to Zion National Park. The open highway came to a complete stop for hours! There we sat not knowing what caused the highway holdup. After hours of sitting on the highway, our fellow travelers spilled out of their cars and trucks to stretch their legs. Radio and cell phone news reported protestors were blocking the highway to bring national attention to their cause. 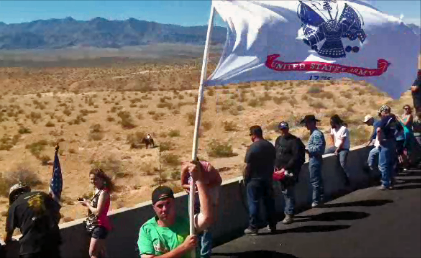 Eventually the vehicles started to move and we found ourselves creeping past a Wild West style, but very current stand-off between a Nevada Cattle Rancher and the U.S. Federal Government. The disagreement stems from the question, “Does the Federal Government have the right to charge Ranchers grazing rights on public lands?” The law is clearly written that the U.S. Government has that right. However the Rancher claims those rights are not enforceable in Nevada, a sovereign state. The Rancher has been grazing his cattle on the government BLM (Bureau of Land Management public lands) for over 20 years and he now owes over a one million dollars in grazing fees to the U.S. Government. He says he doesn’t owe it. The Federal Government had taken action and sent Marshalls on horseback out to round up his cattle. The stand-off was tense and the civilians were armed and prepared to stand their ground. We coasted through with a prime view from the RV as the Federal Marshalls backed down, temporarily, and packed up their horses. The Rancher and his wranglers drove their cattle back along the river bed as hundreds of spectators watched on. The drama still is playing out in the National News. No matter what side you find yourself on, it was impressive to witness fellow citizens exercising their free speech rights. It was equally impressive to see to see our government agents acting in a measured, respectful manner. How this drama will end, is yet to be seen. Do you have an opinion? If so, we’d love to hear it. If he has been grazing cattle for 20 years and not paying, what makes year 20 different than year 19? Why didn’t the government begin collections after 1 year of non payment….not after year 20. This seems like the government is making a point, but it’s really not about grazing and non payment! I’d have to agree with you, why did it take 20 years for what should have been a simple pay-up or move your cattle out at the start. I’m not sure what if any point the government is trying to make here. LOL.. you guys! Step AWAY from the Nevada Crazies! Bundy should be imprisoned, his cows, ranch sold for back taxes. That’s what would happen to most people when they break the law…? yes? Good to hear from you. Thank for your input. Your comment reminds me of someone we knew who lost his house to back taxes.Your right that is what happens to those people. Why is he any different? Take this dispute a little further to discover who the bigot rancher is. Thanks for your comment. I know Bundy’s racial ramblings made a big splash in the news and most of his supporters ran for cover, but being a bigot doesn’t really change the issue of 20 years of non-payment. I don’t know if you saw the follow up interview with Bundy when he came on TV with a dead calf and part way through the interview he took off his boot and said it was so he could put his foot in his mouth again. He also said he is putting food on the our table. Well it seems to me more like he’s feeding his cattle for free to put money in his own pocket.